Gov. Ige surrounded by the state’s Invasive Species Heroes and two giant pests — a coconut rhinoceros beetle and a not-so-little red fire ant. Community Hero – The Pacific American Foundation has a long record of involving the community in reducing invasive species and protecting the historic Waikalua Loko fishpond in Kāneʻohe. Business Leader – Serina Marchi, owner of Kaua‘i Seascapes Nursery, has followed best practices recommended by the Kaua‘i Invasive Species Committee to reduce the spread of invasives on her island. Greatest Hit – Solomon Champion, with the O‘ahu Invasive Species Committee, stopped the spread of Miconia trees in the Waiawa watershed by spotting one immature tree in the Ko‘olau range. Hottest Pest Report – Community member Shawn Baliaris has helped stop the spread of mongeese on Kaua‘i by using the 643-PEST reporting system in the state Department of Agriculture. Hawai‘i County MVP – Community organizer Carolyn Dillon has helped coordinate efforts to combat little fire ants on her island. She brought many different government agencies, businesses and organizations together to map infestations and help homeowners. Maui County MVP – The community of Haiku Hill tackled a major infestation of coqui frogs in their neighborhood and kept the pests from spreading to new areas. O‘ahu MVP – Mililani Elementary teacher Sandy Webb has incorporated units on invasive species into her teaching to encourage students to become part of the solution. Kaua‘i MVP – Kawika Winter, director of Limahuli Botanical Garden, has played a crucial role in protecting over 1,000 acres of priority watershed area on Kaua‘i’s north shore. How you can help: If you spot an invasive pest, call the hotline, 643-PEST or go to ReportAPest.org to report pests online, pinpoint your sighting on a map and provide details. From little red fire ants to Rapid ʻŌhiʻa Death and Zika, invasive species can affect every part of life in Hawai‘i. 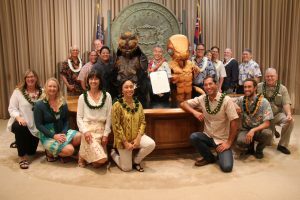 Now, for the first time in the state’s history, the Ige administration has developed a coordinated, comprehensive plan to tackle the threats and harms from alien species that can threaten the state’s economy and people’s health and well-being. “This plan provides a 10-year framework to prevent invasives from entering our borders, detect them if they enter the state, and better manage them if they are already within our borders,” said Governor Ige. The plan includes roughly 150 action items assigned to various agencies and stakeholders with specifics on how and when to take action.